One of the best things about our Maine coast bed and breakfast is our proximity to other seacoast towns. 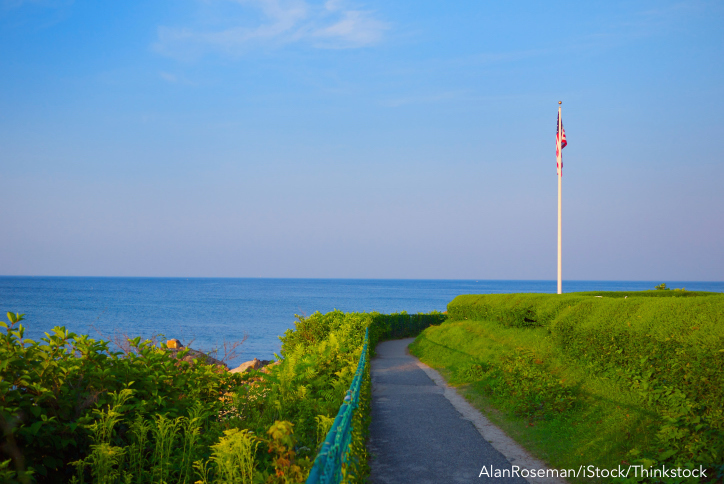 Ogunquit is a lovely oceanside town in Maine that is a popular spot for day trips. There are plenty of opportunities for sightseeing, outdoor recreation, entertainment, and more. While we have an undeniable love for York, we also have a fondness for this neighboring town. If you’d like to make the visit, here are just a few of our favorite things to do in Ogunquit, Maine. With a name that can be translated to “beautiful place by the sea,” Ogunquit, Maine is definitely worthy of a visit. Ogunquit has a history as a fishing village and as an art colony. Today people come from near and far to spend time in Ogunquit to appreciate the natural beauty of the shoreline and enjoy some of the great culture that has become part of the town. Whether you want to spend time outdoors, or enrich yourself with art, one of these things to do in Ogunquit, Maine will satisfy your needs. Marginal Way is on our list of favorite things to do in Ogunquit, Maine because of the pure natural beauty that can be seen when you take a walk down this trail. Marginal Way is a mile and a half cliff walk with a paved path. The pavement makes it accessible to hikers of different abilities and the views make the walk worthwhile for everyone. This beach is clean and wide, perfect for walking and searching for shells. Ogunquit Beach is also known to be rather picturesque as photographers enjoy taking shots of the beach at different spots. A visit to Ogunquit Playhouse is without a doubt one of the best things to do in Ogunquit, ME. This summer theatre company wows audiences season after season with world-class performances of old favorites and new productions. The Ogunquit Playhouse produces five musicals each season with the highest quality productions around. Big name actors and audience members are often seen on stage and off at the Ogunquit Playhouse. The Ogunquit Museum of American Art is a great place to visit for those who appreciate American Art. The OMAA, as it’s known, has a permanent collection of paintings, sculptures, photographs, and graphics. It also plays host to a variety of temporary exhibits. The collection includes works from members of the Ogunquit Art Colony, like Edward Betts, Charles Woodbury, Hamilton Easter Field, and Robert Laurent as well as other American artists such as Marguerite, Charles Burchfield, Peggy Bacon, and Will Barnet. Originally the home of the fishing community in Ogunquit, it also became the shared home of the artists colony. Today Perkins Cove is home to quaint shops and restaurants as well as several scenic areas perfect for a photo op. Nestled in this York County municipality are some great dining spots, with kitchens that serve a wide variety of dishes. Click over to learn more about 10 of the best restaurants in Ogunquit Maine! When you’re deciding which of these great things to do in Ogunquit, Maine, don’t forget to make your reservations at Dockside Guest Quarters. We’re just 15 minutes away from Ogunquit and offer luxurious waterfront accommodations in York. Our York, Maine, accommodations combine a classic New England aesthetic with modern comforts, making our inn the perfect home-base for all of your adventures. Plus, you have the advantage of being right by our fine dining Restaurant. You can enjoy dishes prepared with the freshest local ingredients available, with flavors that will delight your tastebuds. The ocean views from the dining room are truly breathtaking and will put you at ease, allowing you to fully relax and enjoy your coastal Maine getaway. For an unforgettable experience, the Dockside Guest Quarters & Restaurant won’t disappoint. Check out our recommendations for even more attractions, activities, and things to do in Ogunquit, things to do in York, Maine, and farther afield in Portland and Portsmouth.